For the record, I'm not a liqueur drinker. I'm a whiskey drinker who prefers single malt scotch and single barrel bourbon neat, never anywhere near ice and aired for 10 minutes before first sip after well sniffing in a small cylindrical glass. 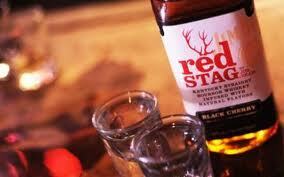 I was expecting to HATE Red Stag - but it seduced me because it puts the taste of bourbon first. It smells like bourbon with a hint of cherry pipe tobacco in the glass: notes of popcorn, molasses, tobacco, leather, and cherry. At first sip the first taste is bourbon: corn, honey, bacon, and molasses. The mid palate explodes with cherry and tobacco and leather. It's sweet, but it's oddly sophisticated. The finish is sweet with honey, cherry, and smoke. It's utterly delicious. I polished off my glass like a hungry wolf. The cherry is robust - but tastes real. It never obscures the bourbon which shines through with character, age, and American cowboy splendor like Johnny Cash's voice. I'm a whiskey snob, but this liqueur is the only whiskey adulteration I've ever loved. The cherry bourbon alchemy is killer mixed with coke. It's even better in a modified Manhattan. I suspect it will work in any mixed drink where bourbon plays a part and you'd consider putting in a cherry.